ur winery is an elastic state, changing and adapting to our whims. Below you'll find a list of developments we've enjoyed this year and strategem for the years to come. 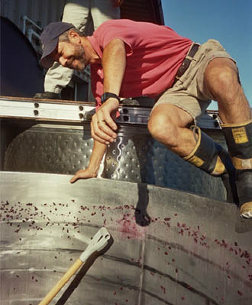 It is harvest time, and while I have focused my attentions to the Cabernet from Elias’ vineyard, I am still fairly occupied with delivering barrels (I am a partner in a cooperage) as well as delivering fermentation products. This allows me to keep the pulse of the industry and learn what people think about the vintage and how they are addressing the various challenges of the vintage. I also try to keep fit and walk my dog Bruno in the vineyards.